3 days only. Expires 12/11/14. You will instantly receive a unique code that allows you to redeem your order online at papajohns.com from the Victoria location. One deal per person please. When ordering at papajohns.com, be sure to log-in and select the Victoria location before using your unique code. 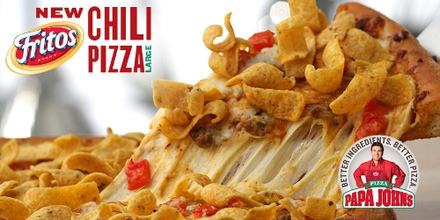 This deal is for a Large Frito Chili Pizza from Papa John’s Pizza when you order online from the Victoria location.